The carp swap goodies came in the mail. Dubbing from Singlebarbed.com arrived the same day. It was like a mini Christmas. I'm going to do a review of the dubbing later. I can say right now it's the best dubbing I have ever seen. Trevor from Fly Carpin did an awesome job getting this swap organized and sorted out. He had the difficult job of divvying up who got what flies and trying to be fair at the same time. Many people submitted more than ten flies and one person submitted over 100. Here was my haul. If you want to know more about the flies there is a forum for each on at Carppro.net. The tyers are answering specific questions about their flies. CarpPro did an amazing job spotlighting the swap in their latest issue of Carp Pro Magazine. I hope I can continue to be in these swaps every year. I joined Trevor's carp fly swap about a month ago. Since then the swap has taken on a life of its own. Many vendors have chimed in to be a part of it. Orvis donated fly boxes for all of the people who participated. The swap itself is being featured in the latest Carp Pro Magazine. Dan Frasier the editor of the magazine did an awesome job putting this together. My fly is on page 108. I used to resent old crotchety fisherman for never sharing their secret fishing holes. As I've grown older and continue to work my way up to being a crotchety old fisherman I understand why they are this way. There are somethings and knowledge that should be obtained by exploring and developing relationships with people. The Internet is killing this way of discovery. All you need now is a computer, message board post, some GPS coordinates and you can find a spot that took others possibly a lifetime to discover. Perhaps the people who are having the best fishing days aren't the ones blogging or writing about how they caught 50 trout in a forum. 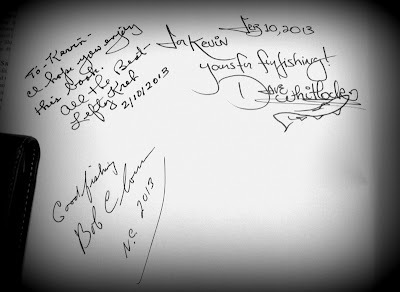 Perhaps it's the people who keep track of their fishing adventures in their mind or share them with close friends. 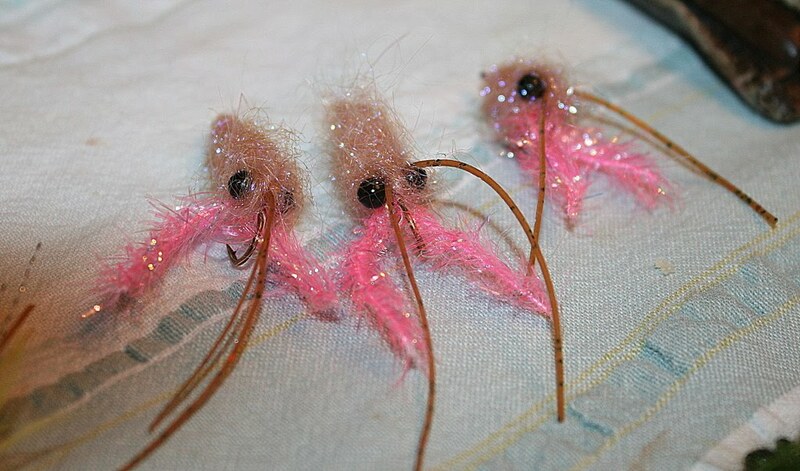 Creating larger body flies can be a pain depending on how much dubbing you need. The time consuming and monotonous part was always twisting a dubbing loop. I knew there had to be an easier way. I started googling dubbing tools and I ran across this video. It showed how to use a dubbing twister tool. I bought one of these and I can tell you they work awesome. There are basically two different styles of this tool. The cheap one shown above and a slightly more expensive twister tool shown below. I can see the one below being more efficient if you are tying a lot of flies. For me the simple tool works fine. The Good, the Bad and the WTF? Inspired by Howard's post from Windknots and Tangled Lines I decided to post my recent ties. I found this fly at Orvis and I loved it. I'm a big fan of beads in flies and I also love soft hackles. This fly had a little of everything. 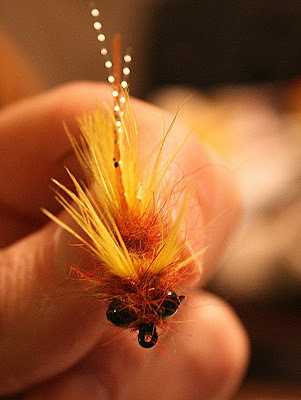 In the process of trying to tie this fly I went a little hackle crazy. I kept thinking about other things to add and try. Next thing I knew half of my tying materials were out on my table. I had so much crap stuff everywhere that I kept losing my scissors and other tools. Even if a fly turns out ugly I want to keep it. When you're tying a fly you kind of attach a memory too it. When you fish it you remember when you tied it and why you tied it that way. Here's what I ended up with and I know it's all over the board. One thing you'll notice is how none of the flies look exactly the same. I have a hard time with that. I also don't stress about it so the flies come out how they come out. I'll have to wait until the spring to try a lot of these. I have been working quite a bit on carp fly experiments. Most of them are similar or an attempt at what is out there. These were my first attempts at Jay Zimmeraman's Back Stabbers. I really like how they came out and they are fairly simple to tie. This is a great video. Very inspirational. 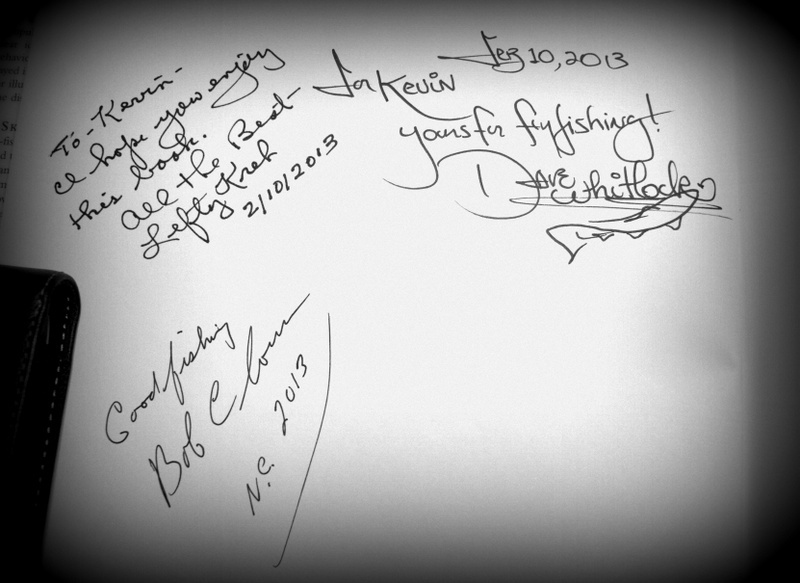 If you want to meet the legends in fly fishing I can't think of a better place than a fly fishing show. What's great about the show is it is very interactive. 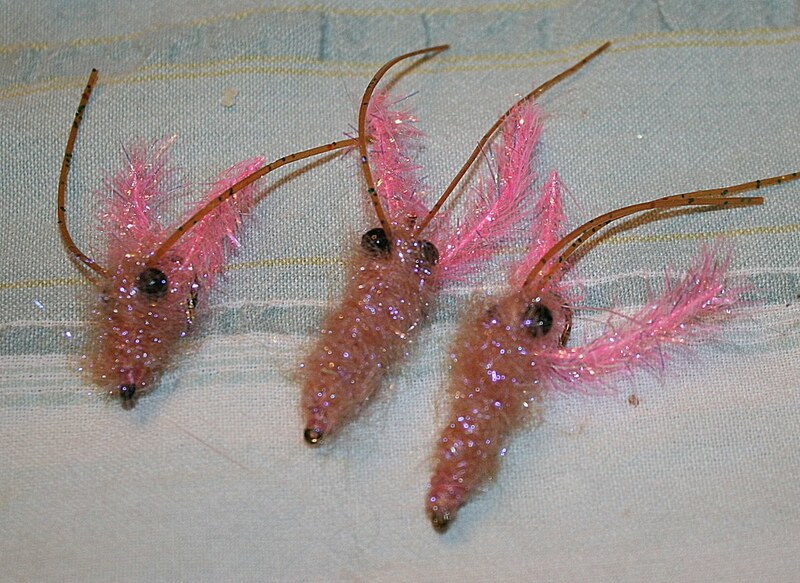 You can share ideas with fly tiers and other fisherman. Take classes, listen to seminars and talks about fishing exotic locations. There's chances to get heavily involved or just watch from a distance. There's deals on gear and the newest gadgets in the industry. My favorite part is the ability to get up close with celebrities and ask them questions from their books. This year I sat through a talk by Bob Clouser. I didn't know much about Bob except for the obvious things. He's considered an expert in fly fishing for bass and the inventor of the Clouser Minnow. After watching his presentation and talking to him I realized what he shared just scratched the surface of his knowledge. Another person I can never get enough of is David Whitlock. The Whitlocks drive from show to show. It has to be stressful traveling all the time and hardly ever sleeping in your own bed. Emily and Dave are always kind and friendly whenever you talk with them. Dave's art speaks for itself. I walked by his booth several times during the day and each time I saw something that caught my eye and had to stop. Out of all the vendors and booths the one I saw the busiest dealt with Tenkara. Every time I walked by there was a group of people gathered around. 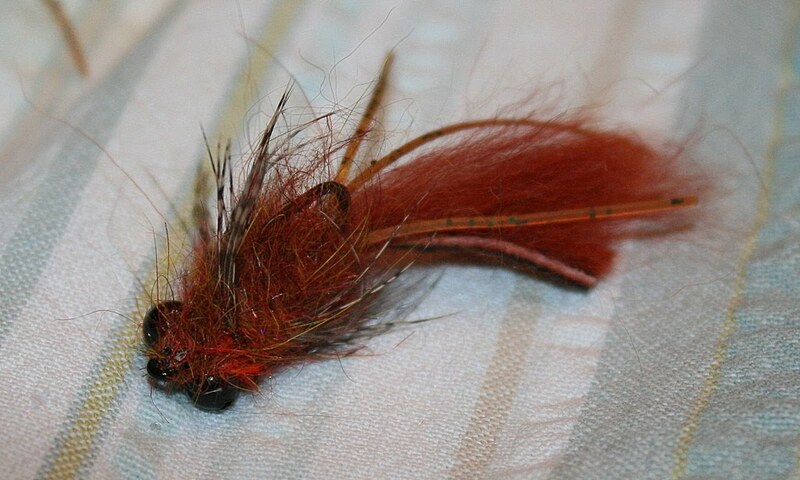 Loften Deprez is a local from NC and an accomplished fly tier. The amazing thing is how much he has achieved at a young age. He's only 15 and tying flies commercially. At the show he was demonstrating how to tie Tenkara flies. Sorry there isn't a ton of pictures. I forgot my camera. The fly show was in a new location for NC this year. The booths had a lot more room and the talks and seminars were in nice rooms with big screens and great sound. I'm happy it's not too far of a drive from Raleigh. I talked to many of the vendors and tiers. It seems many are happy with the new location and talking about how they can expand things even further next year. "Hello Kevin, this is April Vokey." I had been talking with April via email for the last few months. Our talks were around her giving a presentation for the Triangle Fly Fishers. It has been a struggle since April requires a certain reasonable fee and many members of TFF are older and not quite sure who April is. I'm sure once they know what she is all about it will be a no brainer to get her to present for us. Still when I answered the phone I was wondering if maybe I was getting punked. I mean this was someone who I follow quite a bit. I read her blog and have watched many of her videos on youtube and listened to her podcasts. Having her call me was a little over whelming. I kept calm and tried not to seem star struck. I'm glad she called because there was some confusion on where exactly TFF was. She was visiting NY soon and hoping she could combine speaking at our club. When I explained we were in NC she laughed and explained the situation. I was amazed at her professionalism and candor on the phone. I'm still amazed she took the time to call me. Interesting materials for this fly. You can see the crayfish are almost iridescent. The thing that really stands out are the eyes and antennae. There's basically no sign of the claws. 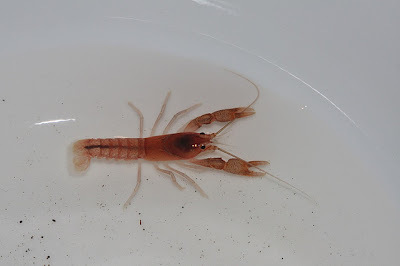 I found some pictures of juvenile crayfish and the claws are pretty prominent. So the challenge is what is the best way to imitate these. 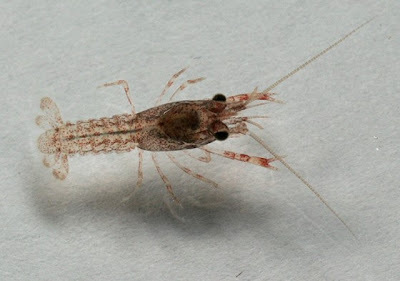 I have seen several crayfish patterns but nothing that was similar to the transparent baby crayfish. I decided to take a shot at it. I'm not totally in love with these but they do have a small crayfish look. The bad part is I really didn't have anything for a tail. I could have clumped the dubbing really thick at the tail but I was worried about too much buoyancy. I tied quite a bit of wire on the hook to get this fly down. I was thinking about maybe shaping the wire like a tail and wrapping the dubbing around that. The only bad thing about that is the wire is soft and would become misshapen easily. I'll have to wait a few months to try them out. Until then I'll just keep playing around and making prototypes. I've continued to work on some other patterns I'm sure will work in VA by my Father In Laws. It must be the cold that has me thinking about warmer water and bass. 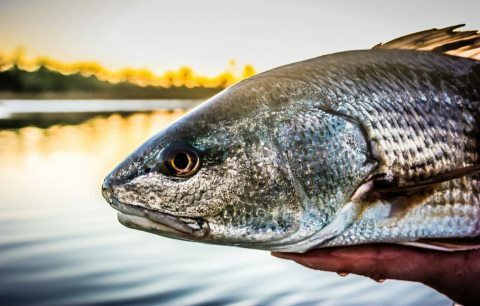 If your friend invites you to go fishing for red drum but work is kind of busy, the weather looks sketchy, or it's super bowl weekend. JUST GO FISHING! Or you'll be sitting at home looking at pics like this.